Armed with a keen knowledge of art history, McEnroe knew in order to build an outstanding art department, he would not only need good teachers; he would need exceptional artists who, in their own right, were making a name for themselves within the contemporary art scene. Among the esteemed artists Bill first hired were Jack Baker for painting and William Winterbourne for ceramics. Soon, the full time art faculty expanded to fourteen including Carlisle Cooper, James Danisch, Barney Dietz, Robert Fogata, Ellis Jump, Gerd Koch, Harry Korn, Richard Phelps, Tom Roe and Hiroko Yoshimoto. Part time faculty included Daisy Hassell, Wesley Johnson, Norman Kirk, Viqui McCaslin, Debra McKillop, Mary Michel, Robert Smith and Myra Toth among many others. In addition to teaching watercolor, Art History, Art Appreciation and Scene Design at Ventura College for thirty two years, Bill chaired the Fine Art Division for fourteen years and was the Founding Director of the New Media Gallery. Soon, after the District unified each department; Art, Music, Theater, Photography and Dance, under the Fine Art Division, the departments blossomed collaborating on major theatrical and musical productions. Bill referred to this period in Ventura College history as The Golden Years. Bill had a love for music and drama. Working with fellow faculty members Al Wilkinson, Leroy Haberman and Frank Salazar, he designed and built numerous stage sets. Among his most notable set designs were Amahl and the Night Visitors for a 1963 Ventura College production and Dark of the Moon presented for the 1965 Grand Opening of the new Ventura College Theater Building. In addition to his work at Ventura College, Bill was a Scenic Designer for South Dakota’s Black Hills Playhouse Summer Stock from 1970 to 1979. In 1984, Bill designed the stage set for Johann Strauss’s Die Fledermaus for Ventura County Master Chorale and Opera Association production at the Oxnard Civic Auditorium. Bill authored several books relating to Art History including, Art Appreciation and Art History, WMC Brown Book Company 1965, Outlines and Lectures in Art History 1965-1979, Kendall-Hunt and his most recent featuring his pastel drawings and original poems La Grande Livre, published in 2010. William McEnroe was born in Fargo, North Dakota and grew up in Massachusetts where he received his first formal art training as a teenager at the prestigious Boston Museum School of Fine Arts. Enlisting in the Navy in 1942, Bill took Quartermaster training and was assigned to the sub-chaser “Felicia.” Later he was assigned to a high speed troop carrier in San Francisco which delivered 5,000 troops to various South Sea battle areas in ’44 and ’45. Bill was aboard the first ship to enter the Japanese harbor of Osaka, after the bombs were dropped at Nagasaki and Hiroshima. In 1946, he entered California State University, San Jose on the GI Bill, where, in 1949, he received a Bachelor of Arts Degree majoring in Art and Theater. In 1950 Bill was accepted to Stanford University and received his Masters in Art. Both degrees were awarded with Honors. Post graduate work included studies at UCLA, the University of Oregon, and the University of Mexico. He was a Professor Emeritus in Art from Ventura College, where he taught for thirty two years, retiring in 1982. In 1989, after spending a short time living in Cambria, CA, Bill and his wife, Carolyn, a sculptor, moved to Olympia, WA where two of their five children lived. It was in Washington that Bill discovered pastels recalling, “All of my art junk was in storage when someone gave me a 12 stick set of colored pastels, and, whoopee, I was off!” Bill became very active in the art community, serving as President of the Olympia Art League while maintaining a busy teaching schedule and exhibiting his work internationally. He has had over fifty solo shows, including the Davis Gallery, Mexico City; Academia des Belles Artes, Durango, Mexico; Diogenes Gallery, Athens, Greece; Santa Barbara Museum of Art, CA; and Ryder Gallery in Los Angeles. In 2011, the Museum of Ventura County mounted Four Masters: Four Legends honoring William McEnroe, Carlisle Cooper, Norman Kirk and Gerd Koch for their innumerable contributions to the culture of Ventura County and beyond. 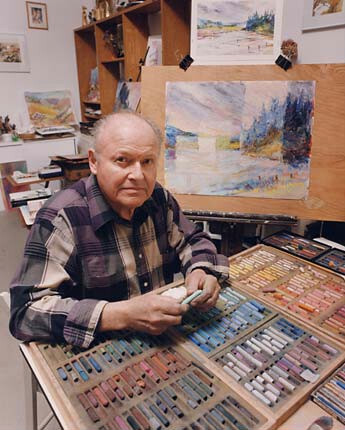 Bill was a Signature Member and Distinguished Pastelist in the Northwest Pastel Society (NWPS); a Signature Member of the National Watercolor Society (NWS); and a Signature Member of the Pastel Society of the West Coast (PSWC). William McEnroe documentation took place in 1998. The FOTM Archive contains extensive information about this artist.